Hasegawa Tohaku (1539-1610) is remembered as one the most influential Japanese painters of the pre-Edo period, and several of his works survive today as National Treasures. Unfortunately, art lovers in the US haven’t been able to enjoy his work in person; until now. A Giant Leap: The Transformation of Hasegawa Tohaku opened this month at the Japan Society in New York; it’s never been a better time to celebrate the work of the sixteenth-century Japanese artist. The first US exhibition to focus on the stylistic transformation of Tohaku, the show stresses Tohaku’s move from an unknown, province-based painter to one of Japan’s most important artists, focusing on his scroll and screen paintings. With a combination of elegant and stark representations and brightly-colored, intensely detailed pieces, Tohaku’s work, like many of his contemporaries, encircles a central theme: nature. Read on for our pick of some of the exhibition’s most memorable paintings, and let us know your favorites in the comments below! If you would like to know more about Japanese art, you can check out our Ultimate Guide. Today considered the proverbial ‘missing link’ between Tohaku’s early and late work, Birds and Flowers was the work that art historians cite to argue that two supposedly different painters —Nobuharu and Tohaku — were actually the same person. This was because Tohaku signed his work with the former name when he was younger, causing confusion among the Japanese art history community. One of the highlights of the exhibition, the screen is made up of pine trees, birds, and a stream which flows out of the screen: a beautifully simple and typical piece evocative of the period. Another highlight and a rare example within the exhibition of such vivid and expressive colors of reds and greens, this pair of hanging scrolls feature ink on silk to create their intense coloration. With their carefully rendered birds and startling white blooms against a brown background, it’s definitely a memorable example of Momoyama period art. Tohaku’s work features many recurring motifs: birds such as crows, herons, emblematic Japanese flowers such as blossom, or high-rising pine trees, often with the backdrop of hazy landscape in soft hues. In Tohaku’s pine tree painting, today valued as a national treasure, we see a wonderfully simple but impactful representation of shadowy trees, which almost appear ghostly against their backdrop; a brilliant example of the stark simplicity that Tohaku could adopt in his works. The stunning Willows in Four Seasons utilises a similar iconography, through its simple representation of the natural forms of a willow tree. In this example however, the image is painted on paper overlaid with gold leaf. The brilliant gold background creates a sense of reflection and expresses the sensation of sunlight shimmering through the leaves. 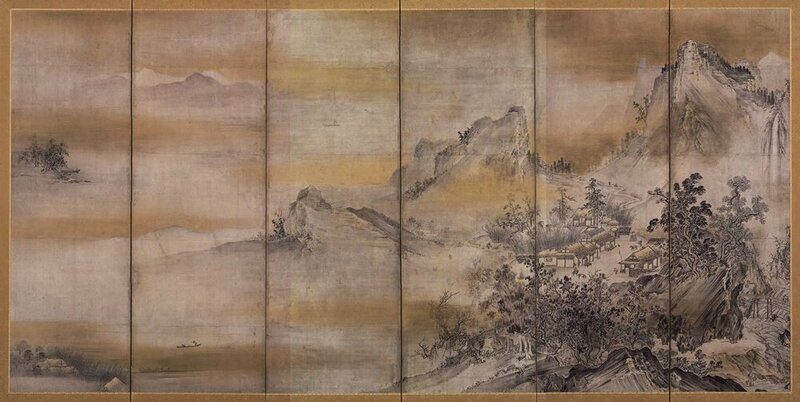 Hasegawa Tohaku has had an enormous and enduring impact of Japanese art; in particular on the style known as Nihonga. Find out more in our Concise Guide to Nihonga. These beautiful, and again highly detailed and meticulously rendered silk screens, capture a quintessential Japanese wintry landscape, with snowcapped peaks, basic dwellings, bare trees and far-off mountains. Its gold frame and soft yellow tones give the work a dream-like feel; it’s the sort of piece you need to see right in front of you, to really appreciate the level of detail and time taken by Tohaku when creating this masterpiece. This hanging scroll is a fascinating portrait of 14th century general Nawa Nagatoshi, one of few portraits by Tohaku that survives today. The general is portrayed in exquisite detail along with other characters in the middle ground. His stony stare proves captivating, as do the careful structuring of the different sections of the painting, built up through layers with their different colors. Other highlights from the exhibition include the opportunity to experience Tohaku’s works as though in a Buddhist temple, as visitors to the gallery are encouraged to sit barefooted on the floor in front of some of his pieces. Visitors can also take part in a weekly meditation class within the North Gallery. Have you seen some of Tohaku’s paintings in person? We’d love to hear what you thought, let us know in the comments below.